There are cycle stands all around Stockport, both in the town centre and across the borough. These are shown on the TfGM interactive cycle map. 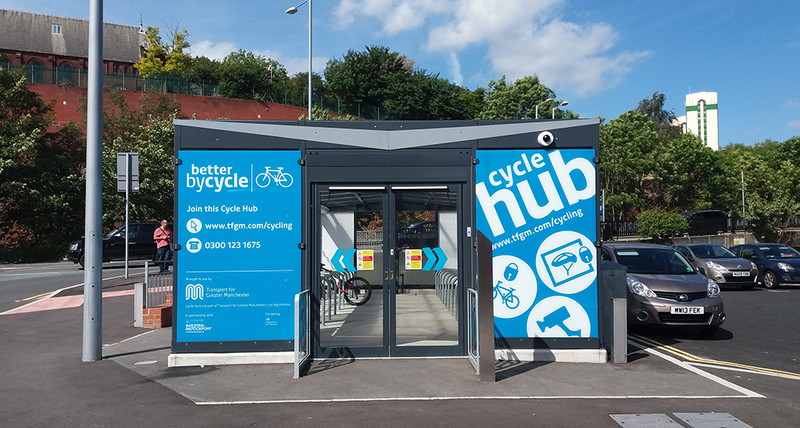 In addition there are two cycle hubs in Stockport, one at the NCP car park at Stockport Railway Station and the other at Tiviot Dale near Merseyway. The hubs provide secure, undercover parking and access to lockers for a small annual (or daily) fee. When parking your bike look for secure, immovable cycle parking which is bolted securely or embedded into the ground. This should allow you to lock both your frame and your wheels to the stand. Parking which only allows your front wheel to be locked should be avoided as thieves can remove your front wheel and still take the rest of your bike. It is generally advised to spend at least 10% of the value of your bike on a lock. If you can, use two different types of lock to deter thieves.